McFly You Bojo, Hoverboards Don’t Work on Water… Unless You’ve Got the Hoverboard by ZR! There have been plenty of attempts at hoverboards in the past, but none of them have really touched our Back to the Future aspirations – but this one might be even better than our dreams, at least on water. The crazy cross between a surfboard and a hovercraft allows you to fly 16 feet above the water at speeds that will have you outrunning even the most Biff-like bullies. All you need to get sky surfing is a watercraft, an hour of training and a serious sense of adventure (or desperate need to outrun your enemies). A strong jet of water, produced by a 59-foot hose attached to a watercraft, propels the rider into the sky and, as the popular YouTube video shows, you can perform some incredible maneuvers once you get airborne. The board allows one rider at a time, but you also need a friend to drive the speedboat or personal watercraft to run it. Or you can also purchase a separate piece that allows you to ride without a separate watercraft. The Hoverboard works in both the ocean and in lakes, wherever you have at least 13 feet of water depth and room to maneuver it (so not your backyard swimming pool). 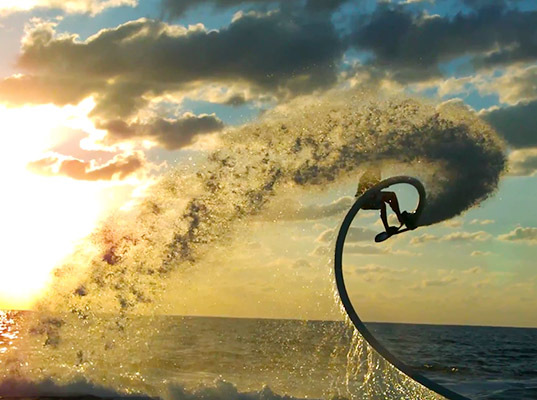 The company also manufactures the Flyboard, which shoots riders into the air with dual jets of water. If you can’t wait to get hovering, you can pre-order the board for $2,675, a full year ahead of Marty McFly’s own hovering adventures. There have been plenty of attempts at hoverboards in the past, but none of them have really touched our Back to the Future aspirations - but this one might be even better than our dreams, at least on water. The crazy cross between a surfboard and a hovercraft allows you to fly 16 feet above the water at speeds that will have you outrunning even the most Biff-like bullies. All you need to get sky surfing is a watercraft, an hour of training and a serious sense of adventure (or desperate need to outrun your enemies).